It's the Ride! 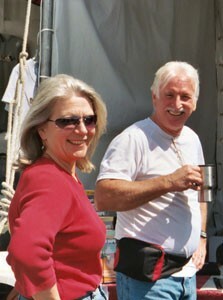 : Kathy Storin and Richard Battles of RKA. North Bay motorcyclists frequently have to undergo a self-administered reality check. Marin, Napa and Sonoma counties are blessed with some of the best motorcycling roads on the planet--Highway 128, Stewart's Point Road and Highway 1, to name just three--and many have fallen under the spell of these marvelous twisting ribbons of fairly well-groomed asphalt. Serious aficionados have been known to stay in the saddle for days, just to prolong the buzz. Staying in the saddle for days is what the folks at RKA are all about. The Healdsburg-based company, which takes its first two initials from founders, owners and avid motorcyclists Richard Battles and Kathy Storin (the A stands for "accessories"), manufactures soft luggage that transforms virtually any mount--even a scooter!--into a serious long-distance touring machine. For those of you who ride around in cars, or "cages" as they are known by motorcyclists, an explanation is in order. Most motorcycles don't have trunks or even glove boxes. This presents somewhat of a problem for the long-distance motorcycle traveler. Where, for instance, are you supposed to stash your camera, your lunch, your spare change of underwear? RKA's soft luggage is the answer. Manufactured onsite in Healdsburg from tough, water-resistant Cordura or heavy-duty polyester, the luggage comes in a variety of shapes and sizes. Enormous saddlebags that drape over the seat easily hold enough clothes for a week's worth of camping. Still have more things to pack? Stuff them in a handy tail bag that attaches to the rear of the bike. If you still need more room, there are eight flavors of tank bags to choose from. Prices range from $49.50 for the smallest tank bag to $211.20 for the largest set of saddlebags. There's a rainbow of color options, and bags can be designed to match any particular bike's paint scheme. Richard and Kathy have come along way since 1985, when in a short four-month span, they met, got married, moved from Southern California to Northern California and started RKA in the garage of Richard's mom's house in Rincon Valley. Richard supplemented their income by working at Radio Shack, but after five years, sales were strong enough to allow him to quit and focus on the company full-time. The pair, who will celebrate both their own and RKA's 20th anniversary next year, have developed a close working relationship. "I'm not a real creative person, I'm a craftsperson," explains Kathy, who formerly made silks and accessories for the horse-racing industry. (She met Richard, a former thoroughbred trainer, when he came in for a set of blinders.) "Richard is the creative mind. I'm just the technician." In the beginning, Richard and Kathy loaded up the RKA trailer and traveled coast to coast, hitting all the motorcycle shows and races they could find, including many visits to America's premier motorcycling race, the Daytona 200, and its accompanying madness known as Bike Week. With Internet sales from their website burgeoning, the pair decided to cut down on their traveling. But they still occasionally pine for the road. "We miss the traveling," Kathy says. "We met so many people. We can go to almost any state and there's always somebody we can go riding with." Not that going to Daytona every year didn't have its drawbacks. "You can only see so many fat people in thongs--men or women!" she laughs. For the past several years, the couple toyed with the idea of expanding RKA into a first-class motorcycle boutique, with a full line of accessories and even a big-screen TV to host motorcycle-related events at the shop. Unfortunately, Healdsburg turned out to be slightly too far to travel for the hordes of finicky motorcyclists in San Francisco they expected to draw, and Richard tired of trying to keep merchandise they didn't make themselves in stock. "Basically, we're back to doing what we do best," he says. Because the company is small--in addition to the two of them, they employ an industrial seamstress--it's able to respond to custom orders more quickly. Winter is the slow period, and Richard uses the spare time to conduct research and development on new luggage items. He's currently designing luggage for bicycles after getting bit by the cycling bug last year. But don't think Richard and Kathy are giving up motorcycles. On any Sunday, you're likely to find them at the head of a pack of snarling sport bikes winding their way out to Stewart's Point. As the RKA motto states, "It's the ride!" RKA is located at 1423 A Grove St., Healdsburg. Winter hours: Monday-Friday, 8am-4pm. 707.433.3727. www.rka-luggage.com. From the December 8-14, 2004 issue of the North Bay Bohemian.